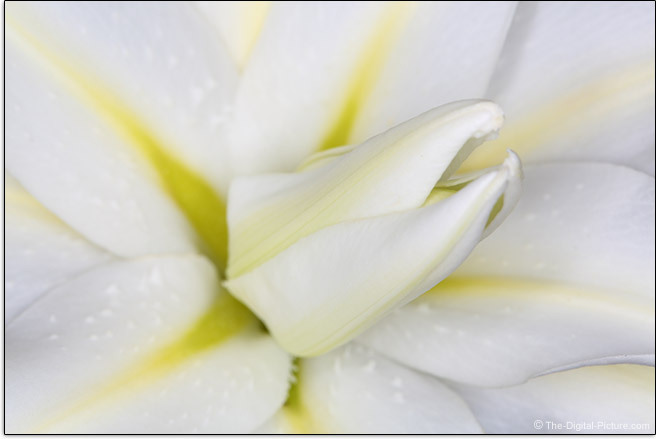 Macro photography is great fun and amazing macro photos are not difficult to capture, but adequately lighting a very close subject and preventing camera and/or subject motion blur are two of macro photography's biggest challenges. By addressing both of these issues, the Canon Macro Ring Lite MR-14EX II Flash lands right at the top of the most valuable macro photography accessories list. 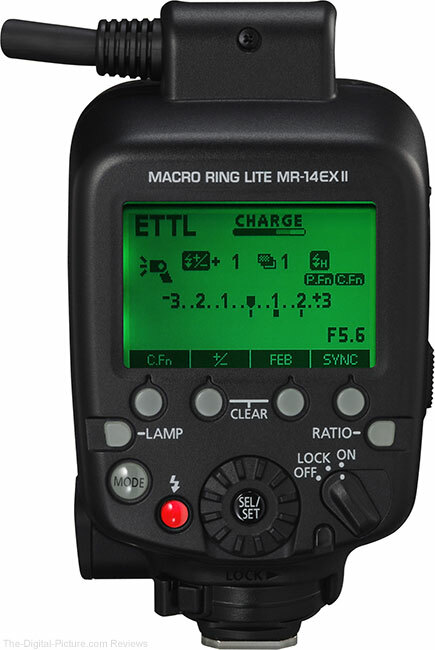 The MR-14EX II is a well-built and well-designed ring lite flash that is very easy to use and an extremely valuable asset in macro photography. 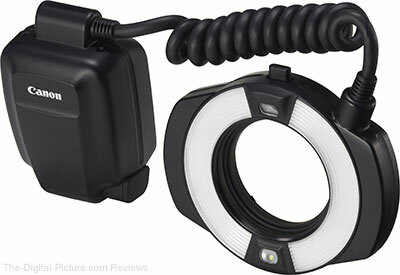 The Canon Macro Ring Lite MR-14EX II Flash is composed of a flash unit and a control unit with a heavy-duty coiled cord connecting the two. 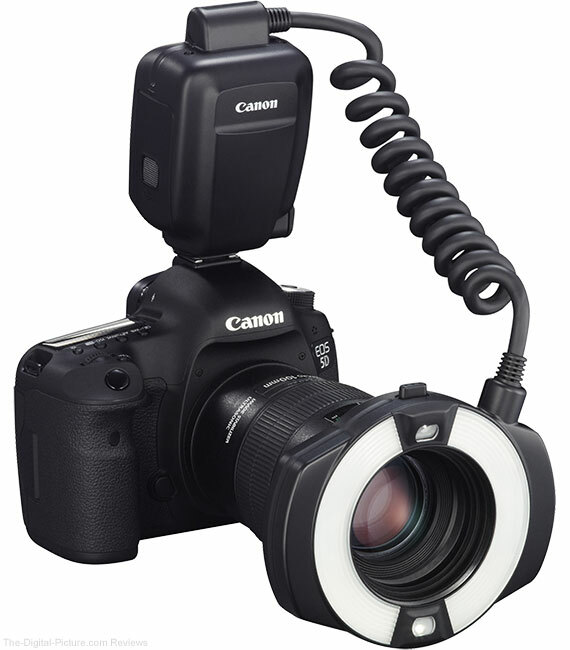 The control unit, appearing to be right out of the flagship Canon 600EX-RT Speedlite Flash, slides into any Canon EOS DSLR camera's flash hot shoe and locks into place using a lever. The flash unit clips into a groove around the end of any compatible Canon EF, EF-S or MP-E macro lens or a Macrolite Adapter. Other brand macro lenses and some non-macro lenses can be used with Canon's macro flashes with the proper Canon Macrolite Adapter installed. Macrolite Adapters, resembling a filter with no glass, turn into a lens' filter threads and provide the needed groove for macro flash unit attachment. These adapters are currently available in 52mm, 58mm, 67mm and 72mm sizes. A press on the button at the top of the flash unit opens four retaining fingers that are designed to drop into a grove at the end of the macro lens or Macrolite Adapter when the button is released. The flash can be installed at and rotated to any angle desired. The front of the MR-14EX II flash unit has 67mm filter threads useful for attaching the lens cap (included) or for mounting 67mm-threaded filters. With the exception of the EF 50mm f/2.5 Macro lens (due to clearance issues), the above-listed lenses are compatible with filter use. Lens hoods cannot be used with the ring lite with the MP-E 65mm Lens being an exception. Residing outside of the lens opening on the flash unit are the dual flash tubes (the nearly 180° arc-shaped lights) and the dual focus assist lamps (the small oval-shaped lights). The MR-14-EX II's white LED focus assist lights can be turned on for a 20-second timed duration using the dedicated button on the back of the flash, or if the custom function 18 feature is enabled, a double-half-press on the shutter release can turn on the focus assist lights. If you are familiar with the Speedlite 600EX-RT control unit, including its large LCD and backlit control buttons, you are going to feel right at home with the MR-14EX II's control unit. If you have been using the Macro Ring Lite MR-14EX (version I), you will definitely appreciate the upgrades found in the MR-14EX II’s control unit. The biggest visible upgrade is the 172 x 104-dot, green or orange-illuminated, contrast-adjustable LCD panel. The LCD panel provides an instant view of the current flash settings and provides a guide while adjusting those settings using the buttons and dial. At the bottom-right of the back of the control unit is a 3-position power switch that includes a settings-locked position. Next to the power switch at unit's bottom/center is a set button with a dial surrounding it. The button and dial work together to make setting adjustments very easy. Left of the flash-ready/test light button is the mode button with ETTL (automatic) and M (manual) flash output level options available. In place of the 600EX-RT's wireless button is the MR-14EX II's focus assist Lamp button. Pressing this button turns on the focus assist LED lights for 20 seconds. If 20 seconds is not enough time, simply turn them on again. The LCD’s bottom row provides labeling for the four buttons below the LCD. The functions these buttons control are dynamically determined based on the settings being adjusted at the time. Included in these functions are Custom and Personal functions, FEC (Flash Exposure Compensation), FEB (Flash Exposure Bracketing) and Sync (High Speed, Second Curtain). Simultaneously pressing the two center buttons below the LCD clears/resets all flash settings. Pressing the Ratio button toggles through the available ratio options. The two flash tubes operate as separate flash units that are individually controllable. When the flash unit is installed with the release button upward, the camera-left flash tube is "A" and the camera-right tube is "B". The letters designate the flash group for each flash, matching two of the groups used Canon's wireless flash system. Both A and B flashes can be used at the same power level (ratio control off), flash A or B can be independently turned off, or the ratio between the flashes (A:B) can be adjusted from 8:1 through 1:8 in 1/2-stop increments (equivalent to 3:1 through 1:3 in f/stops) to allow control of the light profile on your scene (example below). Also available are the A:B,C and A:B:C ratios. Since there are only two flash tubes in this unit, the addition of a "C" reveals the MR-14EX II's wireless flash control/master capabilities. The MR-14EX II is able to optically wirelessly control an unlimited number of compatible slave flashes, controlling ratios in up to 3 groups (A/B/C). The built-in flash units remain group A and B-designated, but additional slave flashes can be included in the same groups or as part of the C group (typically background flashes). FEC, High Speed synch, FE Lock, FEB, manual flash and Stroboscopic flash settings on the master flash are automatically set on the slave flashes. The Canon optical wireless system requires line-of sight, though indoor use can support non-line-of-site remote flashes if the light bounces off objects in the room sufficiently to communicate with the remote flashes. The transmission range for wireless communication is approximately 9.8' (3m) indoors and 16.4' (5m) outdoors. The extents of periphery wireless reception are +/-40° horizontally. 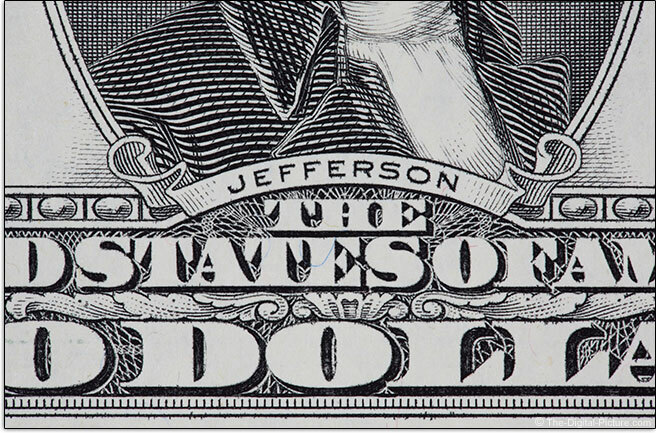 Four slave channel IDs are available to avoid conflicts with other photographer's flashes. A memory menu option allows a configuration to be stored for future use. There is a very good reason for using wireless slave flashes with a macro flash and I'll get to that reason soon. The Canon Macro Ring Lite MR-14EX II Flash is specified to have a guide number of 34' (10m) at ISO 100 per side or 46' (14m) when both sides are used simultaneously. Normal flash full recycle time ranges from 0.1 - 5.5 sec. depending on how much charge is remaining in the capacitor after the flash is fired. 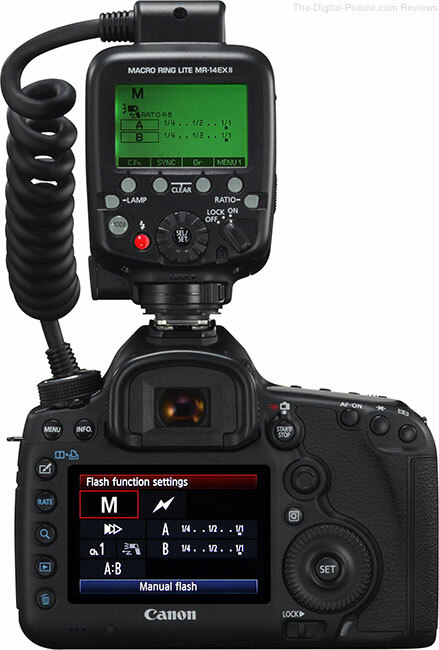 New for the MR-14EX II is a quick flash function that allows the flash to fire before the capacitor is completely charged. The quick flash recycle time range is 0.1 - 3.3 sec. The MR-14EX II ring flash is powered by four AA batteries for an estimated 100 - 700 flashes. That is a very wide estimate range, but the amount of flash output used for each shot makes a big difference. I have taken over 700 shots with the MR-14EX II using a fully-charged set of Eneloop AA NiMH batteries. To gain more flashes per charge and to gain faster recycling times, use a Canon CP-E4 Battery Pack. Using just the CP-E4 for power, normal flash recycle times range from 0.1 - 3.5 sec. and Quick flash recycle times range from 0.1 - 2.2 sec. The flash-per-charge rating jumps to at least 240 full power flashes (up from 100). Using both the CP-E4 and the flash's AA batteries for power reduces normal flash recycle times significantly more with the range spec becoming 0.1 - 1.9 sec. and the Quick flash recycle times range spec becoming 0.1 - 1.3 sec. The flash-per-charge rating jumps to at least 380 full power flashes when using both power sources simultaneously. Because macro focus distances are typically short, a narrow aperture is often desired to gain enough depth of field to keep the subject sharp. Using a narrow aperture (and the effective aperture becomes even much narrower at very close distance) often means that an at-least-relatively long exposure (and/or a high ISO setting) is needed to obtain proper image brightness. A long exposure means getting sharp images from a handheld camera or with a moving subject becomes challenging. While using a tripod may be the ideal way to capture sharp macro images (even when used with a flash), tripod use is not always practical (an insect may not wait for you to set up a tripod) or desired. Also, a tripod does not help stop subject motion (blowing leaves, moving insects, etc.). Another benefit that a tripod does not provide is lighting improvement over ambient light and the close proximity to a macro subject may mean that the lens blocks some of the available light. The available light source may also not have the quality (spectrum, size) you want. A flash provides high quality, full-spectrum light that brings out the richness of the colors in your subject. When the flash is used as the main light source, both subject and camera motion (unless extremely fast) is frozen due to the very short duration of the flash. Select a flash for macro photography to get high quality light and sharp images. While a non-macro-specific flash can provide the benefits just mentioned, a macro flash offers the ultimate in macro lighting portability and light placement into tight spaces. A macro flash places the light source as close or closer than possible with other off-camera flash setups, allowing light to reach into the tightest spaces to light up nooks and crannies right in front of the lens. When the lens is in the position the lights need to be in, the Macro Ring Lite is the answer. As focus distance decreases, there is less room to incorporate lighting into your scene. 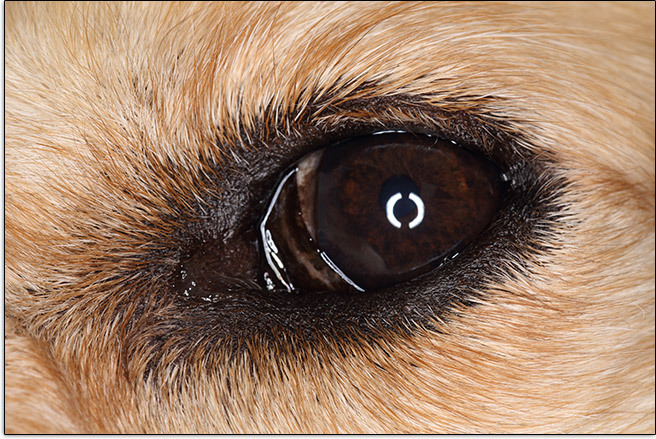 As macro focus distances come into use, lighting the composition often becomes a problem and the lens itself begins to shade the subject (and your own body may also increase that shading). By wrapping the two nearly-180°-arc flash tubes around the end of the lens, a macro ring lite flash can put light onto even the closest subjects. In addition, the ring lite's focus assist lights provide the ability to manual or auto focus on the subject – and provide light needed for easy composition. A macro flash, due to shape and position of the flash heads, does a great job at eliminating shadows. In general photography, a large light source (such as a softbox or a cloudy sky) relative to the subject size is desired when shadows are to be softened or practically eliminated. Large light sources reduce shadows and create soft lighting on a subject. Moving the light source closer to the subject makes that light source larger from a photography perspective. The sun is a massive light source, but because it is so far away, direct sunlight is photographically harsh. The ring lite flash tubes are small, but they overcome harsh lighting effects in two ways. The first is their close proximity to the subject, making them large in relation to the small subjects and the second is that their wrap-around design provides light from nearly 360°. Does your subject have a raised center subject that you need to light around? 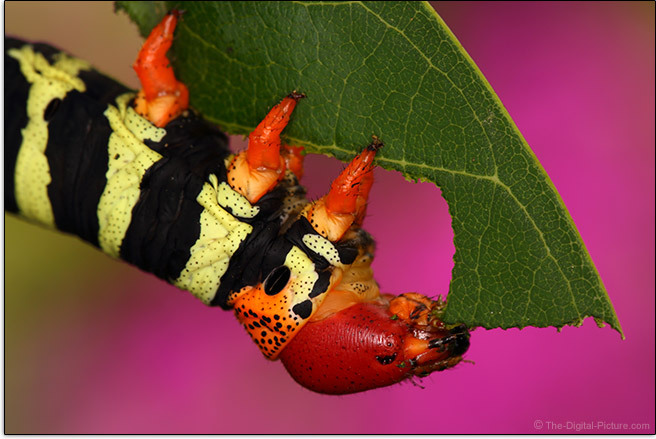 Insects and flowers are two such examples. A ring lite can encircle these and similar subjects with light, avoiding harsh shadows. I'll use a poppy for the next example. 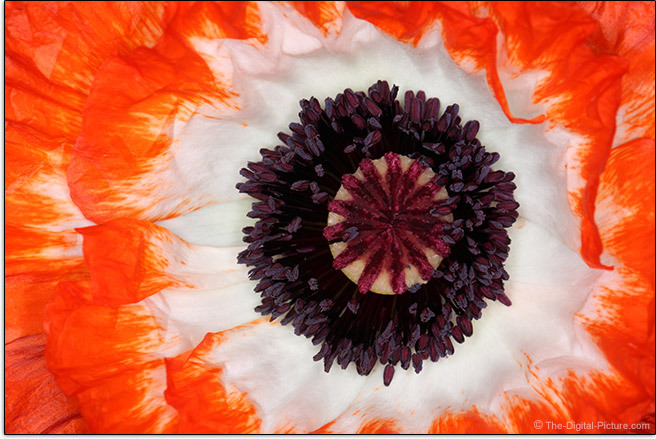 Many flowers including the poppy have a cupped shape that is extremely hard to light from a close distance. Lighting deep inside this flower without creating strong shadows is a big challenge without a ring lite. There are very few good methods to get light around the end of a macro lens without creating unwanted shadows deep inside this flower. 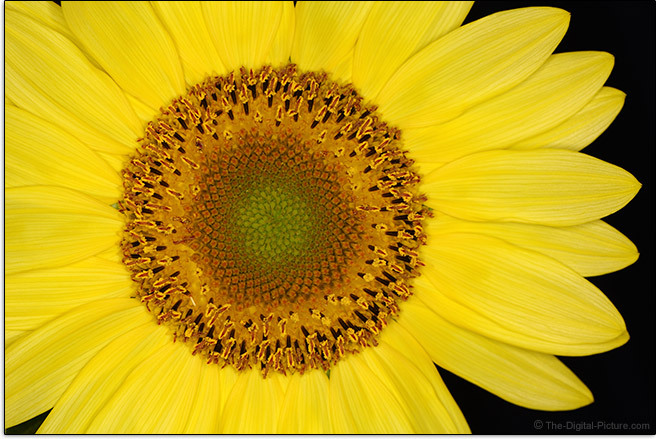 The macro ring lite, with a pair of circular flash tubes positioned at the end of the lens, wraps a light around the flower's significantly-raised pistil while avoiding shadows created by the also-significantly-raised petals. This poppy image result is what I was looking for. Unlike a macro subject being lit with a softbox, a ring lite tends to provide lighting that is somewhat flat. A ring lite is adept at eliminating shadows, but in using the light-from-all-angles approach, subtle tonations in the subject can be lost. The flat lighting on a person's face may not always be perceived as optimal, but natural subjects often have plenty of detail in their overall shapes and colors that are highlighted by a ring lite. There is plenty of color and detail in the poppy to keep me satisfied. Also great was the ease in which this image was captured, thanks to the ring lite. 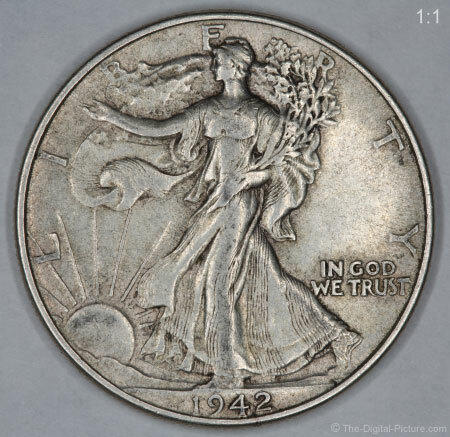 The coin was stationary and the camera was tripod-mounted, but the change in lighting ratio gives the illusion of movement. You are of course seeing shadows changing intensity and direction. 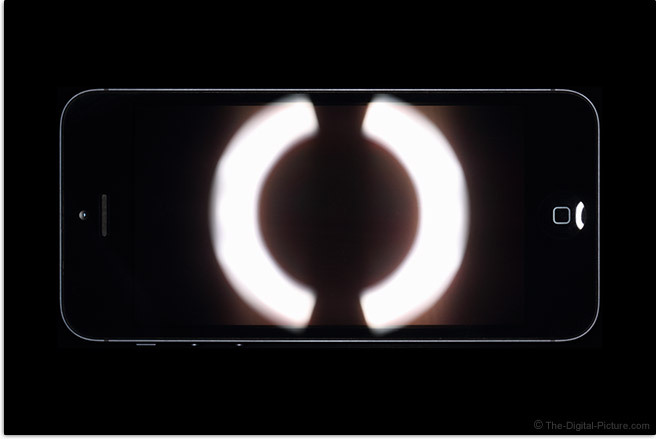 The 1:1 circular shadow is interesting and very ring-lite-identifying. I usually like this look. I have to admit that I usually like shadow a showing in a single direction better than shadows showing in two directions. 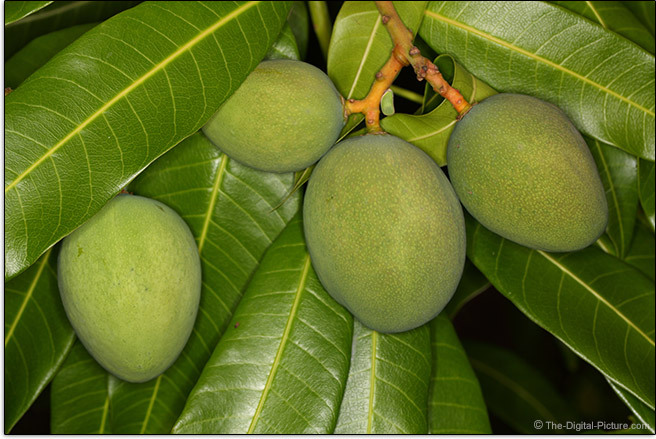 The following example shows the ring-flash-identifying shadows surrounding objects such as the hanging fruit. As illustrated above, the ring flash can be used as a main light for more-distant subjects. A ring light also provides the best-available on-axis light, making it ideal for fill flash. The ring lite excels at eliminating shadows, but as just discussed, it does not always completely eliminate shadows. As also seen in the image below, subject parts can still create shadows in the photo with the MR-14EX II used as the light source. 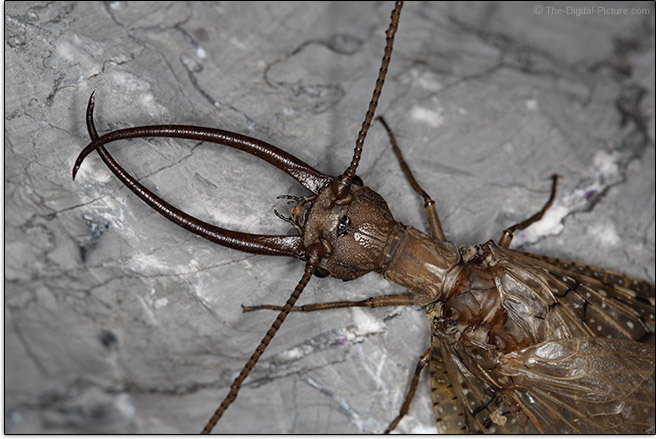 The night is full of great macro subjects (such as the large dobsonfly shown above), but photographing them can be very challenging. A primary challenge is that subjects are hard to properly frame and focus on in the dark. Addressing this problem are the MR-14-EX II's bright dual white LED focus assist lights. I enabled the focus assist lights to be turned on using a double-half-press of the shutter release via custom function 18. I don't have to take my hands off of the camera or lens to turn on the lights for quick use. No dobson fly is safe. Another problem with capturing living creatures at any time of the day is that they frequently do not stay in one place. Moving subjects quickly complicate static lighting setups. The Canon Macro Ring Lite MR-14EX II Flash stays mounted to your camera and lens, ready for immediate use in position you need to move to. There is no easier way to light fast-moving tiny critters. Having the flash mounted does not mean that you have to use it for every shot, but it is there when you need/want it. Black can be a very pleasing background and I like it a lot, but this look that can get old. One way to avoid black backgrounds is to set the camera's exposure for the background and adjust the flash to light the subject. Because the giant 6" (15 cm) tetrio sphinx caterpillar below was in the shade, I was able to align the fully-sunlit flowering shrubs in the background and use flash to light the 'pillar. To get this shot, I was shooting handheld while standing on a steep bank with the wind blowing me, the tree and the leaf the caterpillar was eating. While the 1/30 second exposure with the Canon EF 100mm f/2.8 L IS Lens used for this capture was handholdable under ideal conditions, 1/30th was inadequate for this one. Because the 'pillar was in the shade, flash was able to provide the main light captured in the exposure. Because the flash occurs in a very short duration, the result is similar to if an extremely short shutter speed was used and the 'pillar is sharp. Because the background is a complete blur, any motion blur in the background is not noticeable. If the subject was in the same lighting as the background, I would have needed to use a motion-blur-stopping shutter speed – or use one or more slave flashes to light the background. Lighting an otherwise black background is a perfect use of wireless slaves with the MR-14EX II. A tripod could stop camera shake, but not subject motion such as that caused by the wind in the caterpillar situation. It is very unusual for me to get a motion-blurred image when the MR-14EX II is used for the main light. Of course, if your subject fills the frame and that entire subject is a similar distance from the flash, there is no background to be concerned about. I mentioned non-reflective surfaces and that leads to another macro ring lite topic that we should discuss. When photographing reflective subjects, reflections must be considered. Flash lighting will create reflections and a ring light creates a distinct reflection. While the above reflection may be entertaining and an integral part of the photo, you may find not always find ring light reflections to be beneficial. Ring flash catchlights in a close subject's eyes are not my favorite. At more-normal portrait distances, the catchlight circle becomes small and, unless printed/viewed large, appears to be a circle. 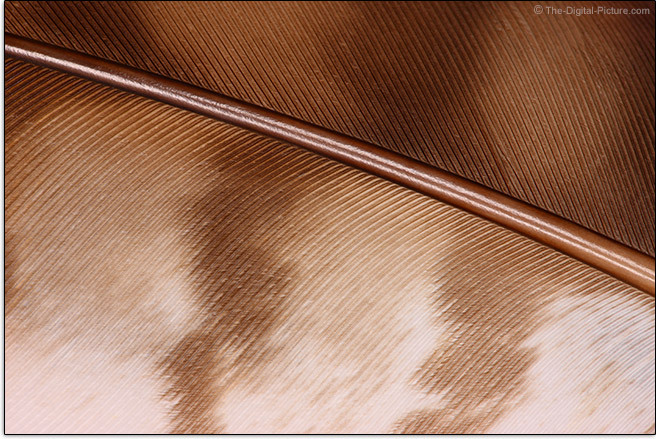 The above image of a feather was captured using the MR-14EX version I. That image would look no different if captured using the MR-14EX II instead. But there are many significant differences between these two macro ring lite flashes. Recycling time (approx.) of 0.1 - 5.5 sec. with Quick flash available vs. 0.1 - 7 sec. While casual macro flash users may not find reason to upgrade to the II, serious macro photographers and new buyers will likely find the II to be the right option for them. The Canon Macro Ring Lite MR-14EX II Flash comes in a nice padded-nylon case that positions the flash and control units next to each other with a padded divider protecting them from each other. The reviewed MR-14EX II was purchased online/retail. Macro lenses are among the most-fun lenses available and the very portable, easy-to-use Canon Macro Ring Lite MR-14EX II Flash makes getting great images with these lenses simple. I can walk around the gardens in my yard for a relatively short period of time and come back with a large number of keeper-grade images. 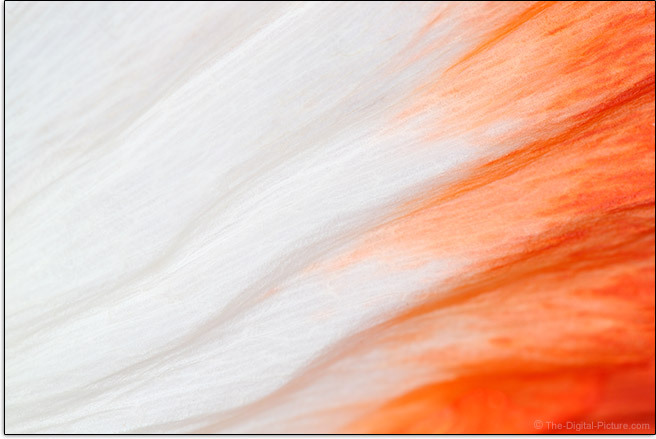 A ring lite is definitely an asset in a macro kit and the MR-14EX II will remain part of my own macro kit.